Archive for the ‘Things to Do in Celebration Florida’ Category. Free event. Notice the sun, its richness painting a glaze on your skin, the light a fingerprint in time. Photo oppurtunity with the easter bunny. 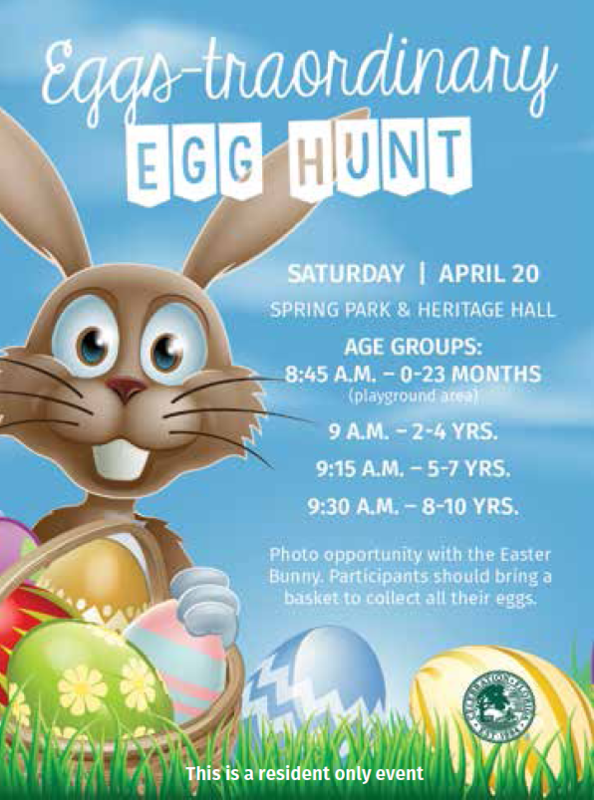 Participants should bring a basket to collect all their eggs. Enjoy the music of Celebration’s own Gary Pinkston on the Great Lawn. Performances at 6, 7 & 8 p.m.
Our April Food Truck Friday will be on the 12th. Make plans to join us from 5 – 9 p.m. at Lakeside Park. Attendees can enjoy the sights and sounds of DJ Joe Magic, not to mention the culinary delights of many of central Florida’s most popular food trucks. Join us EVERY Sunday in Downtown Celebration for some Farmers Market Fun! This is a chance to stock up on Fresh Produce, shop local vendors, and enjoy a day of Family Fun! Spend your Sunday Fundays exploring your local variety in produce, food and crafts! Monday, March 25, 2019; 6 p.m., Celebration Town Hall (851 Celebration Ave.), Room 103 Click HERE for the agenda. Representatives may sign-in between 5:45 and 5:59 in the meeting room. Applications with representatives will be reviewed in the same order as they were received at Town Hall. See the published agenda (above) for applications and sequence. The next application deadline for requests for Structural Changes and Painting New Colors Outside the Palette is Thursday, April 11, 2019 at 5:30 p.m. for review at the ARC scheduled meeting on Monday, April 22, 2019. All other requests will be reviewed by the ARC online. The Vienna Boys Choir, renowned as one of the finest vocal ensembles in the world for over five centuries, is a frequent visitor to North America. The enormously popular chorus is comprised of four separate ensembles of boys between the ages of 10 and 14. The four choirs are of equal standing, and the group’s tours, concerts in Vienna and audio and video recording projects are shared among them. Each choir has a choirmaster and two tutors who travel with the boys. Approximately eleven weeks of the school year are devoted to touring, and each choir member sings about 80 concerts a year. Many of the boys have siblings, fathers, uncles and even grandfathers who have also been members of the choir. This concert is sold out as of 1/10/2019. Part of Celebration Foundation’s Annual Concert Series. Series Tickets available starting August 30. Individual Tickets available starting October 15. It’s back! February 9th is the next Celebration Art & Wine Stroll, and I’ll be there with a tent full of art! A laidback, one evening event to come & enjoy art. And yes, weather permitting I will have my easel there and will be painting! I’ll be at the next Celebration Art & Wine Stroll on Saturday February 16! It’s in my beautiful hometown of Celebration, Florida! It is Saturday night from 5:00-9:00pm. Right in the middle of town – “Downtown Celebration” right up and down and around Market Street, the lake, all the shops, bars and restaurants. It’s sponsored by my local hangout, the Imperium Wine Room and they will have wine, etc. to sip as you stroll. …FREE ADMISSION FOR ALL – I’ll be there at my tent with a few brand new original paintings, canvas prints, prints, etc. Celebration is one of the most beautiful towns in the world, built and designed by the Walt Disney Company, and a great place to visit (and hey – it borders Walt Disney World property – can’t beat that!). Probably around 50-60 artists, live music, great restaurants, wine available, palm trees – come out and see me! Celebration is right off 192 by Disney, just MapQuest it or click on the links above. Then stay on Celebration Avenue and follow the signs to downtown Market Street! Can’t miss! The show is SATURDAY February 16 from 5:00pm-9:00pm. It is an evening/nighttime event. Children are welcome! Pets are too!